As you may realise I live by the seaside and like to take inspiration from what is going on around me for my applique cushions, so I did not even have to walk to the beach but found inspiration while drinking coffee from one of my lovely bone china mugs which are based on local views created by Howard Robinson, a renowned local artist. In the famous words of Mrs Beeton, first choose your cushion, whether it be square or oblong, the choice is entirely yours... I am working with an oblong cushion pad which is 23" x 15". Firstly, iron your main fabric, remember your iron is your very best friend when you are sewing. Normal seam allowances are 5/8" but I am going to be really generous and give myself an inch, so I will need to cut out a piece of fabric which is 25"x17" and set it aside. If you are using cotton ticking, it loves nothing better than to unravel, so cut it out with pinking shears or a pinking blade. Now is your chance to literally go back to the drawing board, I am the least artistic person you will meet so a beach hut design is ideal as it is made up of squares, triangles and rectangles/oblongs. You are now going to map these out on your greaseproof paper! I used my cutting mat and ruler to draw out my pattern - this pic is drawn out on normal paper so you can read the dimensions. 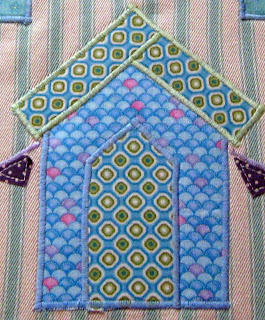 Eaves = Oblong 3" x 3/4"
Cut out your design, pin it on your fabric scraps and cut it out carefully... all of the designs that we have chosen are symetrical so we do not have to worry about cutting out an item back to front. Trace around you pattern piece on the paper side of your iron-on fusible webbing. Now place out your applique pieces on you fabric to see what works best for you, I have found that odd numbers of items work best, a bit like when you are gardening! When you are happy that everything is in its place, peel off the paper from the fusible bonding, place it on the back of the fabric and then put it onto your cushion front and iron firmly into place, the bonding will give weight and strength to your fabric pieces. Do all the huts first and then the doors. 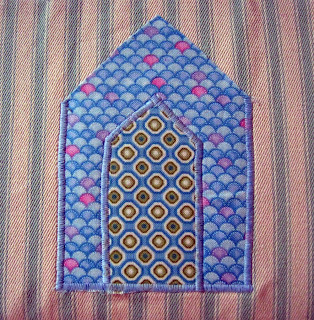 Your next step is to decide which stitch you will use to hold you pieces to the cushion front, you can use running stitch, satin stitch, blanket stitch, in fact let your imagination run riot and use any of the embroidery stitches your machine has - if this is the first time you have done this, have a little practice on some spare fabric, far better to make your mistakes where you will not see them! 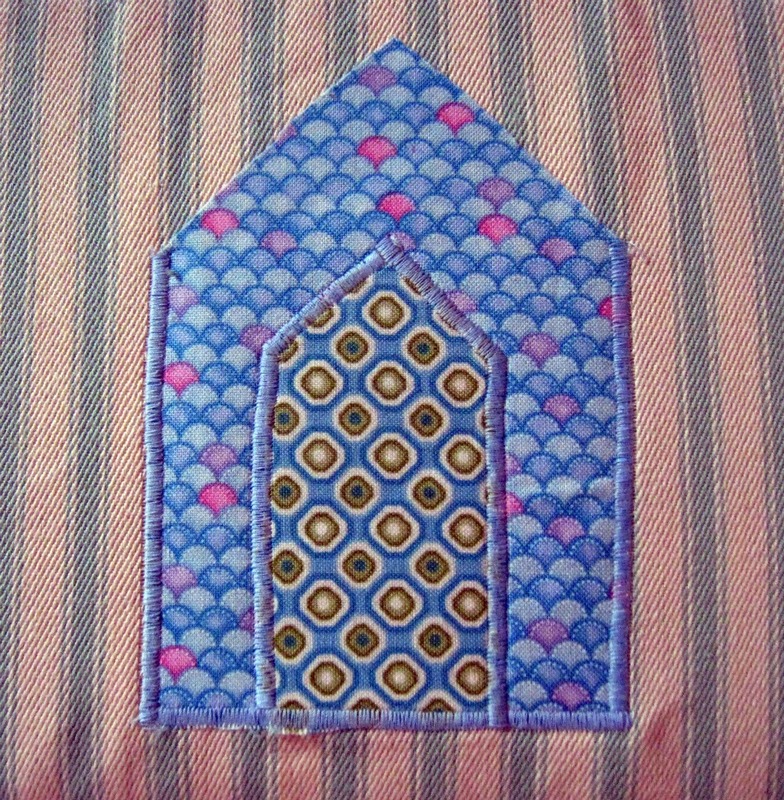 I have used satin stitch for the beach hut with two complementary cottons and a running stitch for the bunting flags. You only need to sew up the walls and base of the beach hut and all around the door. Leave the roof unsewn as you will cover that with the eaves. Next we will attach the eaves, overlay the oblongs to make a right angle which you overlay on the roof, start on the inside left hand side and work around the L hand side and then down the R hand side so that you will be able to complete it in one continuous piece of sewing. Frankly, five beach huts look a little bit boring, so I thought that bunting would lift the cushion a little more. Grab your saucer and place the edge under the edges of your eaves and draw from one to the other using the edge of the saucer as your guide. This will be the "string" for your bunting, sew along your guideline with a suitable stitch, I used satin stitch in lilac as I wanted to use a purple polka dot cotton for my bunting. Cut out an oblong of 6" x 3/4", now fold the left hand corner over to the right side and cut out across the oblong, you have a square, fold this in half and you have a triangle, which becomes your bunting flag. Repeat this until you have enough pennants to hang between your huts. Now repeat this with your fusible bonding and iron the bonding and triangles in place. I used a running stitch to hold the flags in place as I felt that the satin stitch looked too heavy. Now we are going to make the back of our cushion, you need to decide how you want to close your cushion, you could use, a simple envelope close, zip, tapes or buttons and whether you want it to close centrally or off-centre. As this is quite a substantially sized cushion, I am going to use some large wooden buttons to ensure it closes firmly and to make it a little more interesting, it is going to close off-centre. For my cushion, I will need to cut piece of fabric 31" x 17", this is 6" wider than the cushion front, as we will need to fold fabric over to take the buttonhole and to sew on the button, so cut the fabric so one piece is 11" wide and the other is 20" wide... don't forget to use your pinking shears to prevent fraying. Turn over a 1/4" seam down the 17" length of one side of each piece of fabric. Now, you need to take the wider piece of fabric, fold over each seamed piece so that 2 3/4" is underneath and iron it into place. Next, decide how many buttons and where you will place them, I am using two, so I place mine a third of the way down from the top and a third of the way from the bottom. As you can see these buttons are large and my automatic buttonholer would not take them, so I need to mark the length of the buttonhole, you can use chalk, your pen or pins to do this. Change your machine foot to the buttonhole foot and if this is the first time you are doing a buttonhole take the time to do a little practice on a spare piece of fabric. It will create the lower bar first, then run up the left hand side of the buttonhole, then the bar across the top and then back down the right hand side. Then using a sharp pair of scissors cut between the two sides of the buttonhole. With the right sides of your fabric together, place the wider piece down first, as you will need the buttonholes to lie on top when you turn the cushion out. As we have used a striped fabric, match the stripes together, we have a generous amount of fabric to ensure that this happens and that you get a really professional result when you finish. Pin the fabric together and do the same with shorter width, matching the stripes again and laying it over the fabric which contains the buttonholes (four layers of fabric). Sew around the cushion cover. Before you turn the cushion cover out, go to each corner and cut off the corners above your seam, so that you will not have a bulk of fabric lying there and then you will get a lovely sharp corner. Turn the cushion out, sew your button in place and then insert your cushion pad. You have now finished your cushion, ready for that Summer seaside look. This cushion now lives with my friend Sally to remind her of her week spent on hols down in Cornwall. And here are a selection of other Summer and seaside ideas, each of them are based on simple shapes of squares, triangles and oblongs/rectangles which are available in my Etsy Shop. I understand that some people have had probs leaving comments, hopefully I have now resolved this by changing the settings. Wonderful tutorial - thank you - so clear and visual. 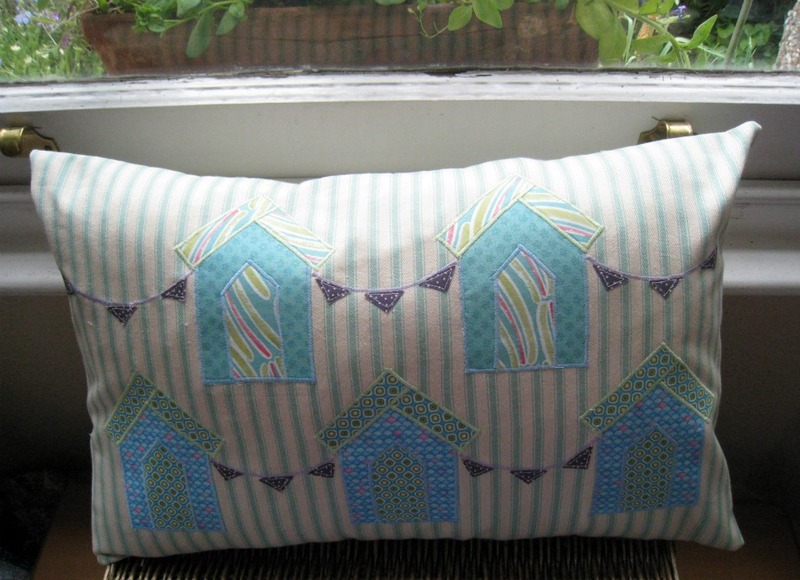 Beach huts and bunting are guaranteed to make the user of the cushion smile! I had quite forgotten how useful fusible bonding can be. Must get some more. Just lovely, I'm sure your friend was thrilled. Great use of colours and I love the design, clean and simple. Thanks for sharing this very comprehensive tutorial. Where did you get your air erasable pen from? Lovely cushions. 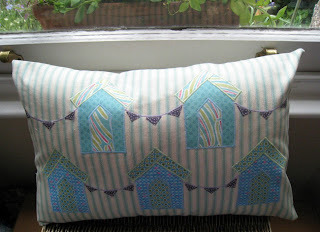 MIL loves beach huts so I think I might have Christmas pressie sorted! I quite fancy one for myself come to that! Thanks for the tutorial - really helpful. Love the mug and the cushions, what is it about beach huts that can make your mind wander, imagining the soft waves lapping the beach a warm sea breeze, sea gulls overhead, ice cream....... dab nabbit got to empty the dish washer, good whilst it lasted. I am a complete novice when it comes to sewing, so thank you for the clear tutorial! Whether I will have the guts to give something like this a go remains to be seen! I love the cushions tho, they are lovely! Lovely mug, lovely cushions, lovely beach huts and such an amazingly clear and detailed tutorial. Well done! I envy you, living near the sea. WOW What a fab tutorial and cushion. I'm so jealous, would love to live by the sea. BTW your photo of the fabric with the scissors is so very artistic! :) That's the sort of thing I always notice. Lovely cushions, great tutorial. They look so fresh and cheery. I love them, so cheerful. 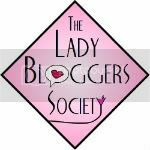 Excellent post - very informative and I love the design. Images of beach huts are definitely one where I can esaily begin to daydream to being somewhere by the sea. 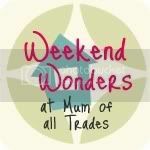 thank-you for sharing a fab tutorial - love the fabrics you have used - perfect! The cushion is beautiful! I am very jealous of you living by the sea too! Thank You millions Ros; your wonderful tutorial is exactly what I have been hoping to find. I have two presents to make and your beach hut cushions will be so appropriate to the occasion! fab tute! thank you ever so much for sharing this with us! your beach huts are gorgeous! Great tutorial and a super-cute pillow. Nicely done! These are SOOO pretty! We have just taken up beach residence, and I think I may try to make some of these for my home. Thank you for sharing! Those beach huts are so sweet, I love the patterns!